In addition to my annual reminder that all foods are better when pretzel-encrusted, this year’s Penn State Web Conference has again left me with several tasty nuggets to chew on. The unifying concept I would say emerged from the sessions I attended was this: Everything is mobile and there is no such thing as mobile. If mobile was ever a discrete context in which people used Web technologies, that is no longer the case. Except sometimes, when it is. And nobody who works on the Web knows what they are doing. That last point is pretty much a direct quote from Matt Griffin (@elefontpress) of Bearded Studios who, along with Patrick Fulton (@patrickfulton), presented what was probably my favorite session of the conference, Designing for Extensibility. The guys provided some specific examples of techniques and processes to make your life as a Web designer easier: the benefits to users and coders alike of CSS pre-processors like Sass; a spec document for every new Web project that leads with the project goals and answers the question “what is the ‘victory list’ for this project?” from day one; a style prototype that covers typography, look, and tone without any content or information architecture at all so that clients can discuss “the pretty” separately (love this idea). But in addition to these useful specifics, Matt and Patrick provided the helpful reminder that the Internet has only just celebrated its 20th birthday. Other communications technologies such as letterpress printing have taken decades and centuries to reach their highest potential as a medium. If you don’t know what you’re doing on the Web, that’s OK because nobody else does either. Just keep on doing it, learn from others, and give back to help make the Web better for everybody. This reminder was especially useful in light of the keynote presentation given on the conference’s second day by content strategist Karen McGrane (@karenmcgrane). Karen also provided a bit of a history lesson by opening her keynote with the story of Digital Equipment Corporation, once the second-largest manufacturer of computers in the world. In 1977, the president of DEC was quoted as saying, “There is no reason for any individual to have a computer in his home.” Today, Karen said, there is probably someone in our organizations saying, “There is no reason why anyone would want to [fill in the blank -- submit their application, pay tuition, register for classes, take classes, read course descriptions, etc.] on mobile.” Due to the digital divide in this country, there are many people who will completely skip the desktop experience of the Internet in their homes and workplaces and will only ever know the Internet through the one computing device they will own: their cellphone. Providing a second-class experience on the phone and expecting people to go to the “real” website to do “real” things may have been an acceptable bridge to mobile; in 2013, it is a cop-out. 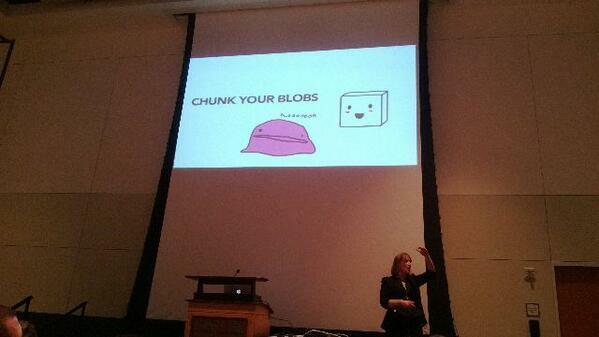 Advice from Karen McGrane: Chunk your blobs. But what am I going to do with my blurbs? In his session immediately following Karen’s keynote, Eric Kim (@huafi) of Modo Labs provided what I thought was a useful counterpoint to this “one-website-to-rule-them-all” approach to creating websites for the mobile context. Eric was involved in developing the MIT mobile framework — now known as Kurogo — that powers many dedicated mobile “m-dot” sites in higher ed. One could argue that dedicated mobile sites are losing ground to the content parity approach espoused by the responsive Web design community. But just because the old idea of the mobile context — you’re checking your email on the way to the grocery store or looking up a map on the way to the restaurant — no longer holds true, does not mean that there are not aspects of the mobile user experience to consider when designing and building websites. It is true that most of the time people are using their mobile devices in an indoor, stationary setting. But mobile interactions do tend to be more spontaneous, more simultaneous (two screens at once) and more likely to occur on “found time” (the spaces between other activities) than traditional desktop experiences. 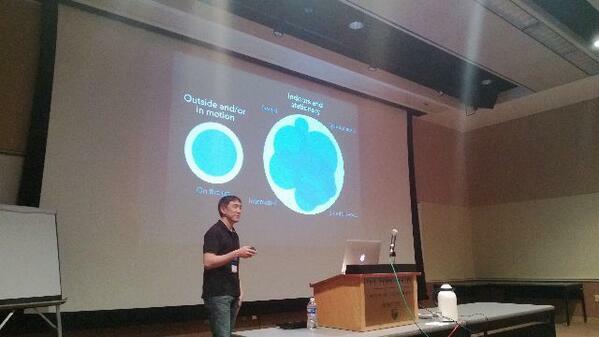 The mobile context, in handy Venn diagram form. For Andrew Smyck’s (@andrewsmyk) grade-school aged kids, the mobile experience is working on their math homework together with their classmates using Facetime, then taking a picture of the blackboard in their playhouse and emailing it to their teacher. Mind = blown. Andrew’s presentation on Digital Kids, Branding, Privacy, and Technology Bias was full of examples from his research into how kids use phones and tablets. My favorite quip: kids can tell the difference between iPhones/iPads and other mobile devices, but they call everything “an iPod.” Like how in some parts of the country, all soda is “Coke.” So well done, Apple marketing team. My least favorite factoid: for these kids, if something cannot be found via a Google search, it does not exist on the Internet. Not good news for libraries or budding librarians. And the one “nugget” I’m going to take home and try to do something with this summer came from Andrew’s discussion on how younger kids use Instagram. It’s not so much a photo sharing service for them as it is a live chat or instant messaging service. One photo of your waffles from breakfast results in a 40-comment-long conversation. Instagram has not been kind to platform outliers (Palm Pre to Windows Phone? That’s me!) so I kinda missed the boat. But that’s my summer social media project: figure the heck out of Instagram. And in the last session of the conference, Donna Talarico (@donnatalarico) covered several social media projects she has undertaken at Elizabethtown College to turn followers into participants, or “stalkers into talkers.” The coolest idea here was an Instagram 30-day photo challenge to increase both awareness of and content for a new Instagram presence at the school. Aaaaaand … steal! All in all, the Penn State Web Conference left me with one final conclusion: The fact that we don’t know what we are doing means we better know what we are doing. Let me explain. We don’t know yet, for example, whether responsive web design and content parity techniques, or mobile-optimized websites, or native apps are going to “win” the cage match for best approach to the fast-developing mobile landscape. Maybe they all have a place. We don’t know yet what form current social networks will take in two years or five years or what new players will emerge or what new uses our audiences will find for both technologies and creative content. And it’s OK not to know. But we’d BETTER know just what it is we are trying to achieve for our institutions, for our students and faculty, for our alumni on any given Web project and we better have a plan for recognizing and measuring whether a particular project has met that goal (even if that goal is just to have some fun). We’re already flailing around on the technology side of things; we can’t afford to flail around from a lack of strategy or evaluation, too. That, and everything tastes better with pretzels.